Chuckle Duster is a London-based comedy group which was set up in 2011. The cast can vary from show to show, but we do have a core team of performers as well as one-off and more regular guests. Above all, our aim is to entertain our audiences; Chuckle Duster is a polished, professional and well executed show. We meet up regularly to try out new games so as to keep our show fresh, interesting and exciting. We play around with combinations of actors, improving our improvisational and comedic skills. We have a multitude of strings to our collective bow (we are film & theatre actors,musicians, dancers, linguists, writers and comedians - it's a mighty bow!) which is why Chuckle Duster is one of the top shows in London (if we do say so ourselves!). Chuckle Duster can be hired for private and/or corporate events. 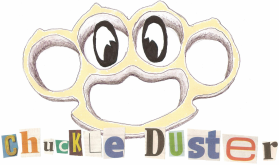 To organise, please get in touch via email (info@chuckleduster.com) with your requirements and contact details. Alternatively, feel free to chat to us after one of our shows!